Ben Zambiasi was born in Valdosta, Georgia on August 19, 1956. Zambiasi played college football with the University of Georgia, where he was selected as a South Eastern Conference (SEC) All-Star in 1976. In 1978, he was the tenth round choice of the Chicago Bears of the NAtional Football League (NFL) in the American College draft. 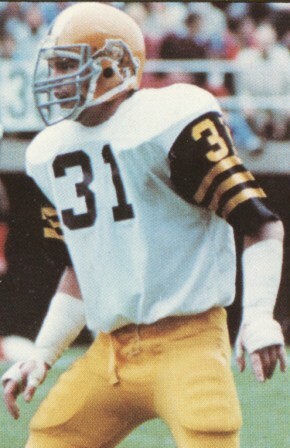 Midway through the 1978 season, he decided to join the Hamilton Tiger-Cats as a Linebacker. Zambiasi’s first season with Hamilton was exceptional. He was named the Most Outstanding Rookie in the Eastern Division in 1978, and received All-Eastern and All-Canadian honours throughout his playing career. In 1979, he won the Schenley Award for the Most Outstanding Defensive Player in the CFL. In 1988, Zambiasi joined the Toronto Argonauts and played his final season of a 11-year career. Zambiasi has been named to the Tiger-Cats Walk of Fame, the Tiger-Cats Wall of Honour and is a member of the University of Georgia’s team of the century.